U.S. politicians Bobby Jindal and Nikki Haley offer two different models for immigrant assimilation. Recently, Bobby Jindal—the governor of the U.S. state of Louisiana, of Indian descent—came under criticism for “not being Indian enough,” a discussion spurred by a Washington Post article that explored how Jindal felt about his heritage. Jindal has frequently called on immigrants to the United States to fully assimilate and follow his own footsteps, which included converting from Hinduism to Christianity and taking on an American name (his first name is actually Piyush). 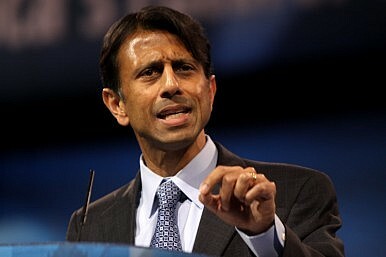 Though Jindal is often criticized for his conversion to Catholicism—critics allege he converted for political purposes in the deep South, where being Christian is often a necessary prerequisite for public office—his conversion is seemingly authentic and it is his devout belief that makes it hard for him to appreciate his roots in a tradition that is drastically different than his current one. South Carolina Governor Nikki Haley, on the other hand, who is now a Methodist Christian after converting from Sikhism, seems more comfortable with her past and family’s faith. Her conversion seems to be a common response of individuals who enter interfaith marriages; she also had a Sikh wedding and attends Sikh worship in addition to Christian worship. All in all, her attitude is more in line with the traditional Indian view of religion that sees multiple paths to the divine. Additionally, she keeps in touch with the Indian community and met with Prime Minister Modi. The stories of America’s Indian-American governors is instructive because it displays the differences between the American and Indian models of assimilation and religious pluralism. The American way of assimilation, though supported by many conservatives in the United States, is thoroughly unconservative because it demands a type of homogeneity that erases the traditions and customs of individual groups. As a counterpoint, consider the Roman Empire. For the Romans, it was highly admirable for people to keep to the traditions of their ancestors; this was the supreme good. At the same time, however, a process of Romanization occurred that brought the peoples of the empire closer together, but never to the extent that it wiped away the distinctiveness between people. The percentage of India that is Hindu (around 80 percent) is similar to the percentage of Americans who identify as Christian: 83 percent. Yet in India, there are multiple groups that manage to preserve their distinct traditions: religious, ethnic, and so on, side by side, in a way that is simultaneously mainstream and distinct, because there are a multiplicity of possible mainstreams. Being part of a distinct ethnic or religious group does not preclude Indians from public office or service because such a situation is not considered to be the hallmark of alienness. There is validity in multiple languages and religions. In this, the Indian model offers a vision for countries like the United States. It should be possible to participate in the mainstream without abandoning one’s heritage. Allegations of sympathies, even financial support, by Hindu Americans to political forces in India must be called out as anti-Hindu.